The world number one, fresh from claiming his record-equalling sixth French Open title, was greeted by fans and rain as he arrived in London for the start of a grass court season he hopes will culminate in a third Wimbledon title in four years. Sunday's 7-5 7-6 5-7 6-1 victory over Roger Federer saw Nadal equal Bjorn Borg's record for singles titles on the Parisien clay. 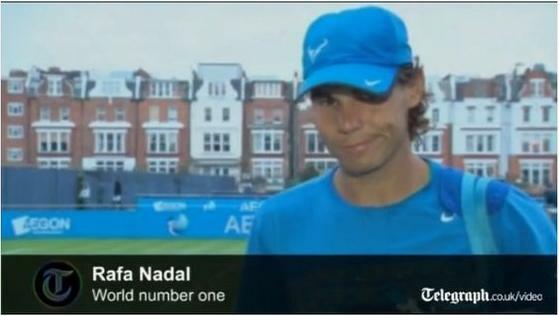 In recent years the clay court expert has adapted his baseline talents to grass, winning Wimbledon for the first time in 2008, and Nadal was keen to get on the practice courts just a day after claiming his latest title. "I am here to try the best in every moment and I've spent one hour and something more on the grass and that is the most important thing," Nadal said. The 25-year-old, along with the other top seeds, was given a bye in the first round at Queen's and will start on Wednesday against India's Somdev Devvarman or Australia's Matthew Ebden.